I thought I’d escaped the City years ago when I quit my job as an investment banker. But today I’m back where I started out, addressing hundreds of people at the Chartered Accountants’ Hall. This isn’t any ordinary financial conference. Today, hundreds of people from across civil society are gathering to discuss how we can transform our finance system so that it delivers for people and planet. I’ll be on stage throughout the day and I wanted to give you a sneak preview of what I’ll be saying. The graphic above shows a startling fact that too few are aware of. 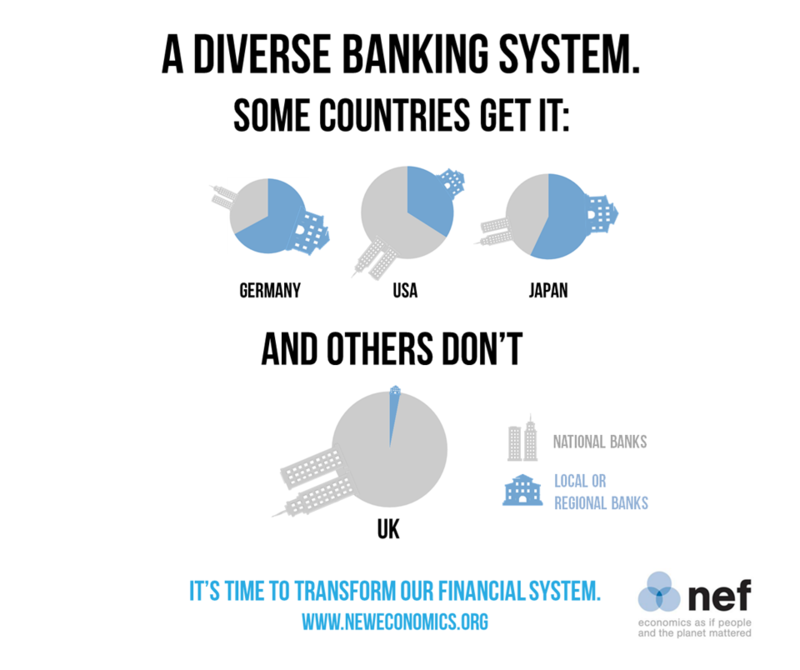 The UK banking system is unique in having virtually no local or regional banks – banks that are focused on operating in and lending to the people and businesses in a specific area. We used to have them in Britain, but over the last few decades they disappeared; the quest for short term profits and efficiencies drove mergers to create bigger and bigger banks. Now our research shows that losing local banks we lost more than just local branches and customer relationships. We lost banks that lend the most to small businesses and those in financial difficulty. We undermined the stability of our financial system and the health of our economy. Other countries with more diverse banking systems like Germany and Japan have fared better as a result. Transforming finance is too important to leave to politicians or those in the City. It’s time ordinary citizens took part in the debate too. Please share this graphic with your friends and family, it’s time we got the banking system we deserved. A meeting of EU fisheries ministers next week marks a once-in-a-decade opportunity to secure the future of EU fisheries and reap the huge economic and social benefits. We’ve just released a short summary of our fisheries work to date and are translating it for distribution across Europe. Our new set of 10 briefings is for environmental scientists, conservationists and anyone else who wants to make the case for protecting the natural world in a language that policy-makers understand. Last week we released the first two – download them and sign up to receive the rest now. We’re currently advertising a range of vacancies – from researchers in our Well-being and Social Policy teams to exciting new roles in our social enterprise, nef consulting. If you support our mission for a better economy and would like to join our team, apply now! Give to nef today and help to create a fair and sustainable economy. Copyright © 2013 nef (the new economics foundation), All rights reserved.